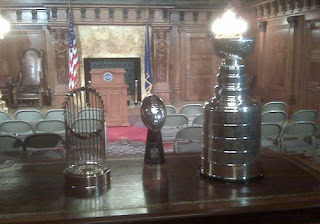 In case you missed it, the Stanley Cup joined the Lombardi Trophy and the World Series Trophy in Harrisburg to celebrate all three championships residing in Pennsylvania. Awesome picture. It looks like the Stanley cup is aflame! Also, if you did not see Tyler Kennedy and Kris Letang doing the weather on KDKA, check this out.